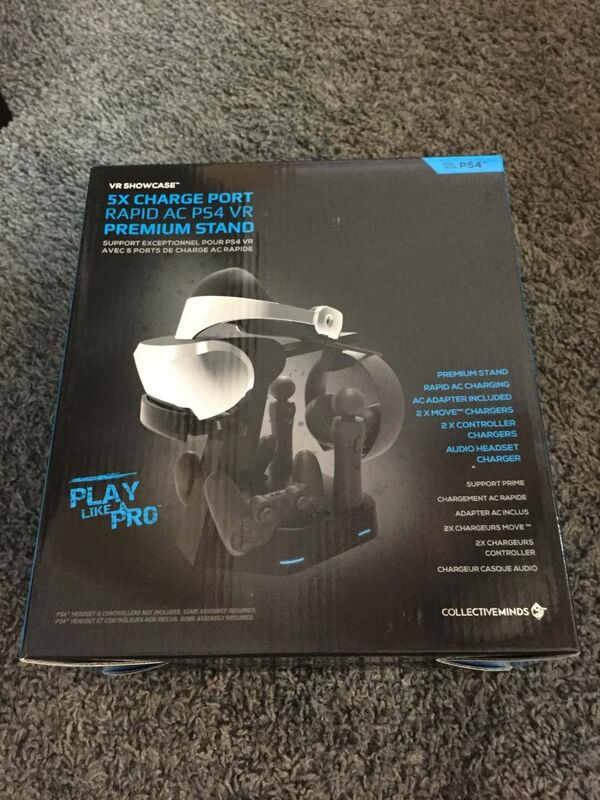 This is a quick review of the Collective Minds PSVR Showcase and Controller Stand which is a great way to hold all your PlayStation VR equipment including the headset, 2 move controllers and it also has the ability to hold and charge 2 PlayStation 4 controllers on top of handling your PS VR. The stand requires you to snap some plastic pieces together but setup is a breeze and is done in less than 3 minutes. As you can see this headset also can hold your PS4 Headset as well behind the PSVR but I didn’t have a headset to put on it while testing it. 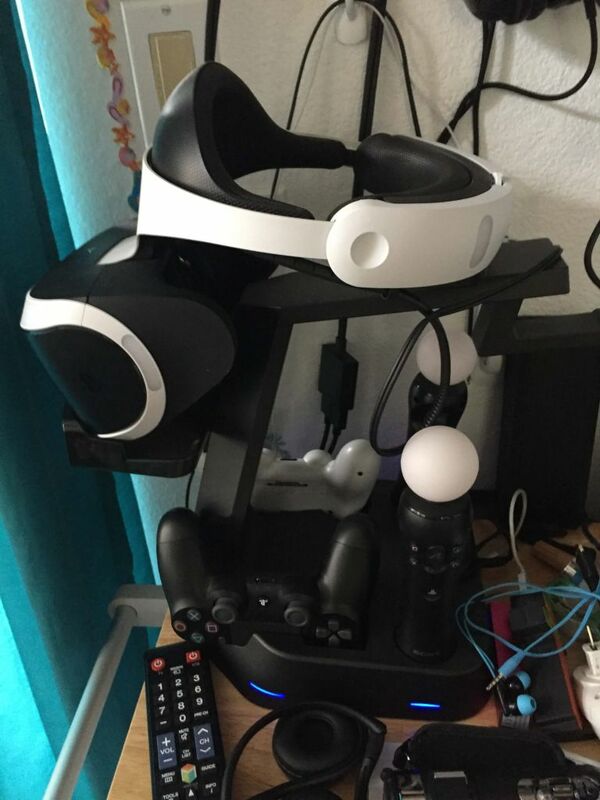 If you own the PlayStation 4 VR you will find that you do need somewhere to store the unit when it isn’t in use, it is bulky and it doesn’t rest on a table surface well. 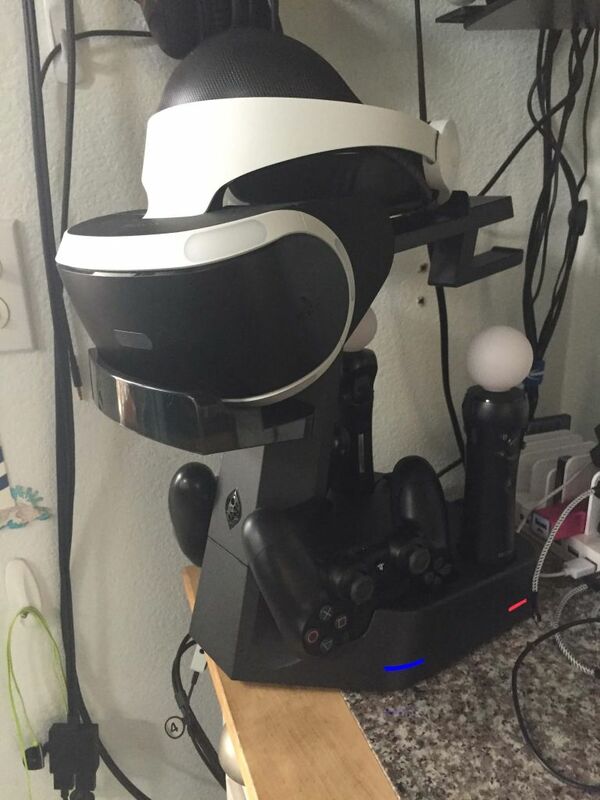 With the combination of the cords, control box, there the PS VR can consume a lot of space on a surface. The move controllers seat in with the buttons facing outward sideways, you can see where the charging connectors line up, they don’t seat in very securely however unlike the PlayStation 4 controllers which seat very firmly into the charging pads and the charging plug. Still you can see the LED lights at the base of the Collective Minds PSVR Stand and this shows you when the controllers and the move controllers are charging. The rest and position where you place the PSVR headset is well done, it holds it naturally and makes it a display showcase and not just a storage. My counter was literally packed with tech stuff at the time, and I had to use 3M hooks to give a place for the PSVR video cables to hang when they aren’t in use, so the thick cord wouldn’t just spool up over the counter or appear haphazardly thrown on the floor. Since you have to constantly use the PSVR and the cables need to be constantly pulled and such I really can’t do much cable management since I have to just unhook the cables and run them across the living room to the couch. So the Collective Minds PSVR Stand won’t solve the cord issue with the PSVR but pretty much makes sure you have a base charging station for your entire PSVR set including 2 PS4 Controllers. You don’t even have to tie up a PS4 USB port with it as it charges via AC too! It also sports a USB port for charging 1 additional USB device like a 3rd controller or a wireless headset that charges via USB as well. Overall the Collective Minds PSVR Showcase gets 4.5 out of 5 stars in my opinion and is a great option for keeping all your PSVR accessories in one place and keeping it from being scratched, damaged or just haphazardly laying on a counter surface. My only question is why didn’t they include a 2nd USB charging port so you can charge all 4 PS4 controllers, why just 3?